In some newly released presentation slides, Nvidia claims the Nvidia RTX 2080 hovers around being 1.5 times more performant than the last-generation Nvidia GTX 1080 in a multitude of games, including Epic Infiltrator, Wolfenstein II and Shadow of War (HDR). Furthermore, if users activate a new Nvidia Turing feature known as Deep Learning Super-Sampling (DLSS), they can expect up to two-times better performance in titles such as Final Fantasy XV (HDR), Ark: Survival Evolved and JX3, according to Nvidia. We saw DLSS in action and a Nvidia RTX 2080 Ti was able to render Epic Infiltrator at a steady 85 frames per second (fps). Right next to the Turing rig was a Nvidia GTX 1080 Ti-powered system that struggled to keep the same experience running near 45 fps with temporal anti-aliasing and supersampling turned on. Nvidia also shared a second presentation slide with the press that claims the RTX 2080 can play a multitude modern PC games at 4K and 60fps. That’s impressive, given that this feat is usually reserved for graphics cards like the Nvidia RTX 2080 Ti and Titan X. However, these are yesteryear games and we’re much more curious about how it would handle forthcoming titles like Shadow of the Tomb Raider and Battlefield V with RTX ray tracing turned on. 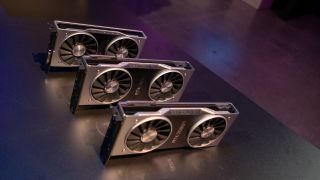 Nvidia also announced it is injecting ray-tracing technology into GeForce Experience with a supercharged version of Ansel RTX. Whereas Nvidia RTX real-time ray tracing usually gives you one rendered stream of light and calculated bounce per ray, Ansel kicks this up with a 30-times factor. The built-in photo feature can do this because its focused on creating one fantastically gorgeous still frame rather than a silky smooth stream of animations. Nvidia’s built-in screenshot tool will also take advantage of Turing’s Tensor Cores with Ansel AI Up-Res being able to turn any old 1080p Full HD image into an 8K masterpiece.